Get an extra £50 added to your trade in value to use against the cost of the new Samsung Galaxy S10 family. On selected phones. NEW Nokia 6 and 7 Plus with Free Google Home Mini. For more information please visit here. Everything Google Home is, but smaller. The miniature smart speaker connects to your Wi-Fi network, and with its inbuilt microphone, it can pick up all your questions and requests from across the room. Get weather, traffic, sports updates, stream your music and set your alarms - just start by saying, "Ok Google". To claim your free Huawei Buds Headphones worth £149 with your Huawei P20 Pro, please visit here, you will require proof of purchase. To claim your free Huawei Active Noise Cancelling Headphones worth £99 with your Huawei P20, please visit here, you will require proof of purchase. To claim your free BOSE headphones please visit. Bose® QuietComfort® 35 wireless headphones II give you amazing sound at any volume. They’re engineered with world class noise cancellation technology that blocks noise and lets you lose yourself in your music. So when you're playing at low volumes in a quiet office, you get the same, consistent quality as when you’re out on a busy street. Google Assistant is built in, so you can play music, receive texts and get answers without having to look at your phone. Just press and hold the Action button, and start a conversation. If you're not a Google user, don't worry. You can use the Action button to adjust your level of noise cancellation from a choice of three settings. 2. Visit www.huaweipromo.co.uk/p20bose and claim your FREE Bose® QC® 35 wireless headphones II in black between 20th April to April May 19th 2018. Offer only available on pre-order ending 23:59 5th April. 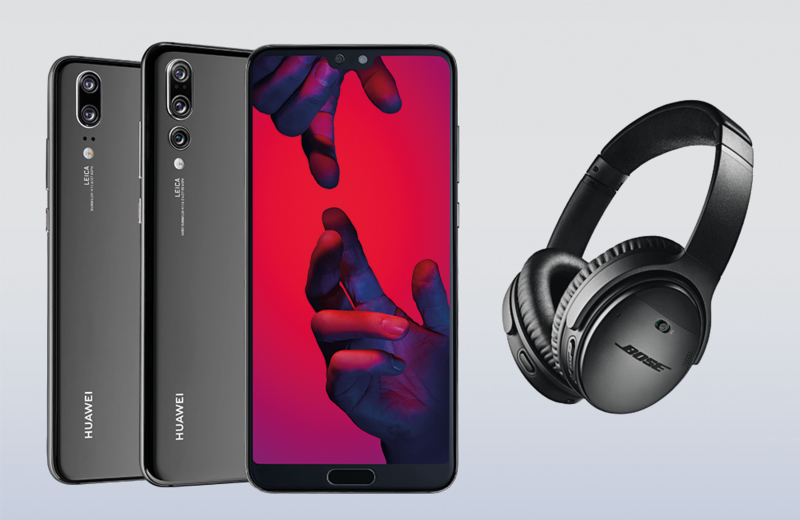 * Purchase Huawei P20 or Huawei P20 Pro on a Pay Monthly contract, upgrade contract or SIM free on pre-order and claim Bose® QC® 35 wireless headphones II worth £329.99 via redemption www.huaweipromo.co.uk/p20bose by 23:59 5th April 2018. Not valid in conjunction with any other offer. No cash alternative. Promoter is Huawei Technologies (UK) Co., Ltd. Consumers who pre-order a Huawei P20 Pro or Huawei P20 (a 'Qualifying Product') by 23:59, 5 April 2018 and subsequently purchase by 3 May 2018, from a qualifying retailer (see Website for details) may submit a valid claim (including substantiation) at www.huaweipromo.co.uk/p20bose (‘Website’) between 20 April and 19 May 2018 to claim Bose® QC®35 wireless headphones II in black (‘Bose Headphones’). Consumers who cancel their pre-order or return their Qualifying Product within 14 days of date of purchase will not be eligible to claim. One claim per pre-order of a Qualifying Product (max. two claims per consumer). Bose Headphones are subject to availability. Bose Headphones will be delivered to a UK address within 30 days of verified claim. See Website for full terms. Cash back with Samsung. Get up to £150 with selected Samsung devices. To claim, please visit here. Oh no, there are no matching deals! This great deal is only available with us! To proceed with this upgrade deal, simply add it to your basket.